Nathan Lightspeed Belt Review - Buy or Not in Apr 2019? If you are an avid runner, you know that having various items in your pockets such as keys, phones, wallets or iPods will hamper down your run, make you feel bulky at the hip and inefficient and will make it feel like your stuff may fall out of your pockets. Well, this is where the racing belt come in. They help you alleviate this weight by storing items around your hip section or beltline and in a secure and comfortable fit. Nathan has offered a race belt of its own and it is called the Nathan Lightspeed Race Day Belt. As you may have guessed by its name that it can be used for actual races and not just casual jogs or runs in the park. The belt is very durable and offers elastic pocket room, although holding larger items, such as even an iPhone 6, maybe a bit difficult if not impossible with the way it has been designed. So keep that in mind. The really nice thing about belts is that besides offering pockets for the essential items like keys and phones, they are a great way to keep water bottles attached to the waistline without bulking you down too much or encumbering you on your run. Being hydrated on runs may be the most important thing for a runner to be able to do. This belt offers some space on its shock cord that includes attachment spots for energy gels to hook onto. On this cord, you may be able to use to hook things like a water bottle, but you will have to see for yourself — it really will depend on how heavy the attached item is. But it does not offer a specific water bottle pocket like some other belts on the market. The attachment spots for energy gels will come in handy for those going on long runs. The belt is useful for long runs and marathons in particular because it is designed to offer a comfortable and no-bounce feeling while keeping essential items you need on your body. Most sprints and short runs or jogs can be done without carrying anything, but it is the long runs where things like hydration and nutrition may come into play where a runner needs to grab some nuts or a protein bar. This is where the belt comes in. It offers a weather-resistant and zippered fuel-storage pocket that you can put the essentials into like phones, keys, as well as nutritious content -- although it runs quite tight for more than a few items. Its cord system also offers ways to latch energy gels onto it, which offer runners a nutritious way to stay energized on runs. The belt is designed to be lightweight and comfortable while on long runs. The main zippered pocket is pretty tight, so overall it is designed to fit. Since it is designed for runners, the belt should be well ventilated, although I did not notice any ventilation shafts or holes on it. It does offer a weather-resistant main pocket section, which means it is meant for runners to use in various climates and temperatures. The belt is designed not to bounce or feel cumbersome in any way. it is made for runners on long runs and marathons where comfort is at utmost importance. It is non-chafing and elastic as well as designed for a custom fit with its various attachment points. The cord system with energy gel placement is nice because it is more comfortable to just grab the energy gels that way than fiddling with the main pocket during a run or race. The belt offers elasticity and various cord attachment options, so it should fit runners of various sizes. It is a one-size fit all design so regarding various size options it is very limited outside of the option you get. Although fiddling around with its attachment spots for the belt, you should be fine. The belt is very durable according to many users who have used it over long-term and when compared to other belts on the market it performs well. Some users, however, experienced that it drops over time when in use with multiple bulky or heavy items in its main pocket or attached to the elastic cord. The belt has everything included you need to strap it on and start running. Purchase some energy gels to launch onto it and put some of your essential items in the front pocket and you are off to the races. The belt offers great style with multiple colors thrown in for good measure. There are two main colors to choose from, and they are black and blue. However, each color also features some other minor colors thrown in for good measure to keep the aesthetical look interesting. 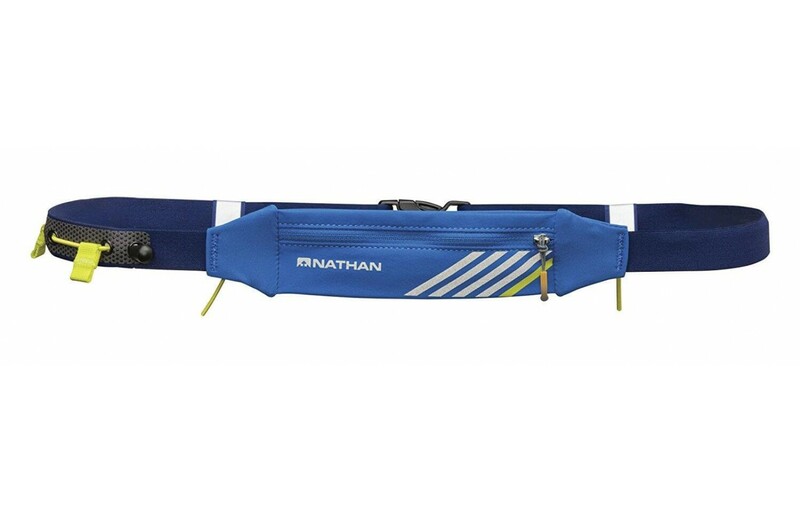 The blue variation, for instance, offers yellow sections for the gel attachment straps and some other sections, such as the cord used to hold the gel attachments in place and one part of the front emblem-design (to the left of the Nathan logo). It also offers a couple of small white sections, such as for the rest of the emblem-design (diagonal stripes) and the Nathan logo area. The black has a similar layout, but instead of yellow and white, those areas are highlighted in orange and white. Overall, the style and aesthetics are well implemented when compared to other belts out there. 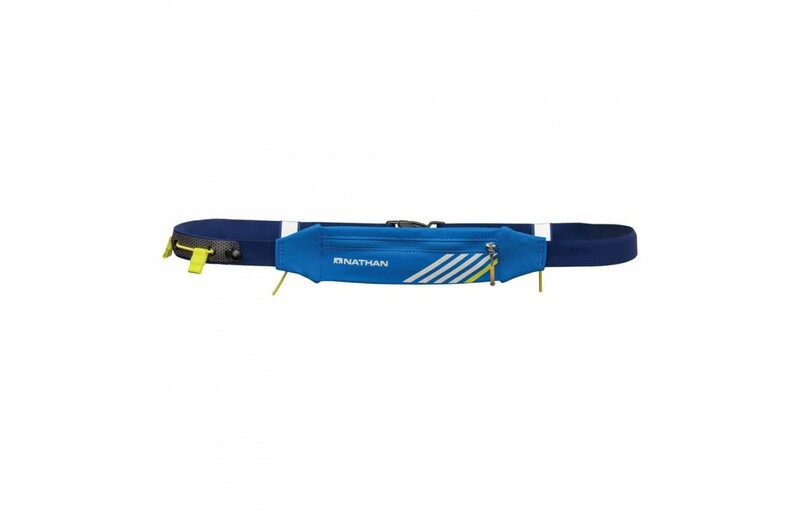 The belt is very low-priced and can compete with virtually any other running-belt or holding-belt on the market. However, on Amazon, it seems more in limited supply and expensive than other retailers. In fact, its current Amazon price for the black variation may come as two or three times as steep as competing belts, so be sure to shop at various retailers or the retailer's website. For anyone who wants a secure, comfortable and tight-fit with a belt on their runs, considering this option. Sure, it doesn't come with a lot of extra pocket room and its ability to hold a water bottle attached may be somewhat questionable when there are more robust belts available and even some with specific water-bottle or hydration pockets. However, it still has a lot to offer for long runs and marathon racing. It is weather-resistant on its front/main pocket section and offers plenty of adjustable headroom as well as spots to latch energy gels and possibly more onto.